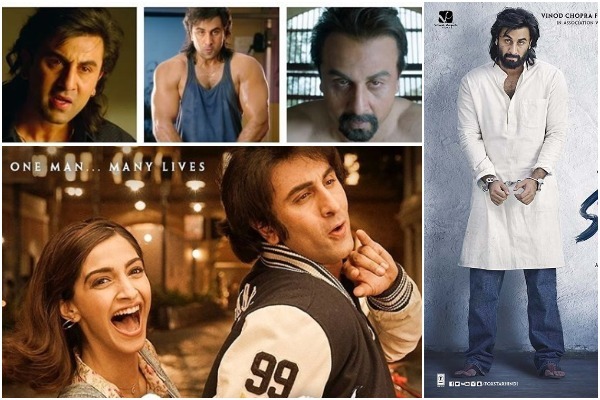 Ranbir Kapoor as Sanjay Dutt in ‘Sanju’ trailer is so amazing that we cannot stop applauding it. After almost a month of releasing of the teaser trailer, the much-awaited trailer of Rajkumar Hirani directed and Ranbir Kapoor starrer ‘Sanju’ has been unveiled! The movie is a biopic based on the life of Bollywood favourite controversial star kid— Sanjay Dutt. The almost three-minute long trailer promises that the movie will show various facets of Sanjay Dutt’s life. From his drug addiction to his time in jail to his 350 ‘girlfriends’ to his father— Sunil Dutt’s belief in him. The trailer begins with Ranbir Kapoor a.k.a Sanjay Dutt breaking the fourth wall and talking to the audience. Sanju tells the audience that he is happy that his ‘autobiography’ will be unveiled soon. In the trailer we see glimpses of Paresh Rawal as Sunil Dutt, Sonam Kapoor Ahuja as one of Sanjay’s girlfriends, Dia Mirza as his wife, Manisha Koirala essaying the role of his mother Nargis Dutt, ‘Raazi’ fame actor Vicky Kaushal as his best friend, Anushka Sharma along with Jim Sarbh and Boman Irani. The trailer sheds light on Sanjay Dutt’s addiction to drugs, his contact with the underworld, the years of nightmares in prison and his rocky love life. Another interesting part of the trailer is Ranbir Kapoor repeatedly saying, “I am not a terrorist”. While the movie promises to be an insight into Sanjay Dutt’s journey from a star kid to Bollywood success to battling his personal demons, ‘Sanju’ seems like a clever way of wiping his slate off clean and creating a positive image, right? In the meantime, ‘Sanju’ is slated to release a month later on 29th June.